How does this subset of cells differ from other T cells, where do you find them, and how are they important to AIDS vaccine and cure research? When a new pathogen enters the body, the immune system uses a variety of defenses to get rid of it. One of the most important responses comes from B cells, which produce antibodies—roughly Y-shaped proteins—to coat the surface of the pathogen and stop the invasion. Antibodies also label the pathogen so that other immune defenses can “see” and attack it. Other immune cells that are among the first to respond are dendritic cells and macrophages. These cells patrol the body and pick up the pathogen or its fragments. They then migrate to the lymph nodes, which are like the hubs of the immune system. Lymph nodes are a key component of the immune system, found all over the body, most prominently under the jaw, under the arms, in the gut, chest, and groin. In the lymph nodes, patrolling cells show or “present” the pathogen to CD4+ T cells. These “helper” CD4+ T cells coordinate the activities of antibody-producing B cells and a set of “killer” cells called CD8+ T cells or cytotoxic T lymphocytes. CD4+ and CD8+ T cells work together to eliminate cells that have been infected by pathogens (SeeVAX Feb. 2004 Primer on Understanding the Immune System, Part I). Scientists have known for quite some time now that HIV preferentially infects and kills CD4+ T cells. 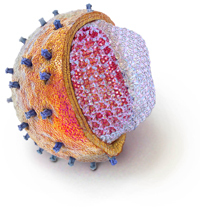 While the immune system tries to fight off HIV by sending CD8+ T cells to kill HIV-infected CD4+ T cells, the rapidly replicating virus eventually exhausts and overwhelms the immune system. CD4+ T cells play a vital role in the antibody response. One of those roles is the delivery of signals that drive the maturation and selection of B cells that generate increasingly potent antibodies. This process, referred to as affinity maturation (see VAX Jan. 2011 Primer on Understanding How Broadly Neutralizing Antibodies Evolve), is critical to the evolution of potent broadly neutralizing antibodies (bNAbs), which have been shown in laboratory studies to neutralize many circulating variants of HIV. Many researchers believe a vaccine would have to elicit such antibodies to provide broad coverage against the virus. A specialized subset of CD4+ T cells help B cells generate increasingly effective antibodies against their target pathogens. This subset is known as the T follicular helper (Tfh) cell, so named for the B-cell follicles or cavities where most Tfh cells reside. The follicles are found in germinal centers, where mature B cells proliferate and differentiate in orde r to make antibodies. One reason Tfh cells eluded identification for some time is that they are primarily found in these B-cell follicles, unlike most helper T cells. Nonetheless, scientists have learned quite a lot about how these elusive cells function, and how they are affected by HIV infection. For instance, they know that Tfh cells express high levels of certain proteins that HIV uses to enter target cells, making them a major site of HIV replication. At the same time, Tfh cells also express proteins that in some instances are helpful for B-cell survival and the production of antibodies, but in others prove to be detrimental. Additionally, scientists have identified two types of interactions between Tfh cells and B cells—one brief and on the fringes of the germinal center, the other a much longer interaction within the germinal center. In different ways, these interactions support the development of bNAbs, many of which have recently been isolated from the serum of chronically infected HIV-positive individuals. Unfortunately, the development of bNAbs is a relatively rare event, arising in only about 15-20% of all people infected with HIV. Scientists believe one reason this may be the case is that HIV drives an abnormal expansion of Tfh cells, thus impairing their function. Based on this accumulating data, scientists believe a better understanding of Tfh cells and their interaction with B cells could be essential to the design of an effective vaccine. Tfh cells are not just important in vaccine science, however. They are also important factors in the hunt for a cure for HIV. A relatively young subfield of HIV science, cure research is an area with lots of missing pieces. But it has lately shown great promise, thanks, in part, to what scientists have learned from 17 years of studying patients on highly active antiretroviral therapy (HAART) (see VAX March 2013 Primer on Understanding Therapeutic Vaccination). HAART regimens potently suppress viral replication in the blood, allowing the body to rebuild its immune system. But such regimens cannot by themselves cure HIV infection, since the virus weaves itself into the chromosomes of resting CD4+ T cells, creating a population of latently infected cells known as the viral reservoir. Scientists believe one possible way to cure HIV would be to locate and drain reservoirs of latent HIV-carrying cells. Such reservoirs persist even in people whose circulating HIV has been effectively suppressed by drugs. Scientists have been studying the blood and tissue of HIV-infected individuals—some who received HAART and others who have not—and compared them to HIV-uninfected individuals to measure Tfh populations. Scientists believe that when the virus infects Tfh cells, it probably contributes to viral persistence because the germinal centers that house most of the Tfh cells are inaccessible to CD8+ T cells (killer T-cells), whose job it is to destroy HIV-hosting cells. These germinal centers also seem to serve as a kind of trap for HIV virus particles, which can then infiltrate the Tfh cells housed there. Scientists are hoping to use what they have learned from these Tfh studies to design drugs that can counter HIV persistence and thus eradicate the virus.